I have been looking to purchase some clothing from here for a long time and finally got the opportunity for my wedding. The shirt I bought was perfect, the process of purchase was efficient and easy. And the follow up on the purchase is persistent. Shipping of the item was also very fast. All in all more than happy on every level with my experience with Historical Emporioum thank you so much for the finishing touch to my wedding outfit. Excellent holster! Just what I was looking for, and good quality too. The price was great. Some places I checked wanted twice the price. A very pleasant, helpful staff. Product and service, just like the good old days! I liked the site and customer service. Only thing I was upset with t hat this was not the hat. It was a bigger one. The hat did not sit on my head right. Had to try to pin it down put did not stay to good. Could not wear the strap. my. Chin broke out. Put I did give your site to a few other people. I always have a great experience with you all! The products are a value for the price and seem well made. Thank you. Very happy with Trousers and shipping. Unfortunately, the item I truly wanted was out of stock. But, I did get the next best thing. Delivery was very fast and the fit and look of the vest I ordered was just right. I am doing just a little something for St. Patty's Day when I visit New Orleans. I was inspired by the Steam Punk wear at a new restaurant at Universal Orlando, Toothsome Chocolate Emporium. I purchased a brown bowler hat there, but really had nothing else to go with it. I do wear fedoras and driver caps and it is just part of my own style. Once home, I thought what could I get for the hat. With the trip to New Orleans coming up, St. Patty's Day too, it was time to put it all together. I located your website and ordered an emerald green vest and puff tie, pants and shirt I purchased locally. I also order a snap front shirt for my fiance' and a Cameo necklace. Excited to put it all together, and more excited as she does not know what I have in store, as it is a surprise. But when I tried it all on, my daughter thought it looked great. I had only one issue and it was my fault. The necklace came in the same package and was not easily found in the box as it was stuck in the corner. I emailed then to ask about it and was told it shipped. Good thing I still had the box. I hope to buy more in the future. The products were for my youngest son birthday gift, the delivery time was quicker than i expected, he loved both gifts. Thanks to you guys, I finally got birthday present that someone really liked. Will be ordering from yall again. I recently discovered Historical Emporium and have ordered several items including vests, ties and a watch. All items I have bought so far have fit very well and are top quality. The service has been outstanding and I have received the items in very timely fashion. I'm thoroughly happy with this company and their products. Had to exchange a few items because of sizing. It was the most painless exchange process I have ever encountered. Great service! I had ordered the wrong size for a jacket (way too big). I returned it and the new jacket was delivered the same week. I did everything from the Product Returns/Reimbursement tab online - without having to bother anyone from the 1-800 number. I am very pleased with the holster, it fit perfectly,its like going back in time when i put the holster on and go out to shoot, it was one of the best deals out there, i will be a customer for life. I needed a costume for a play my daughter was in, but needed it quickly. I found the perfect edwardian suit but wasn't sure about sizing. I called and the gentleman I spoke to sent the outfit in two sizes. I received two days later, the sz small fit perfect and we loved it! Retuned the larger size and received credit right away. Thank you so much! I have no issues with either the service or the product I bought from Historical Emporium. The belt and holster set I bought was of reasonably good quality and the price was equally fair and acceptable. The pants fit very well but I would be remiss if I didn't mention the fact they have no pockets. This was a surprise to me. I wonder what gentlemen did to accommodate their personal items like handkerchiefs, combs, wallets etc in days of old. I guess I'll purchase a men's pocketbook if there is such a thing. The pants are lined and the material is pretty good quality. Top quality product. I'm very happy with my experience. I just had to squeeze the holster for my revolver to fit. Your Rep was very knowledgeable and nice. I just did not read the directions. Amazing overall experience with this company not one complaint w hat so ever. Already planning my next purchases t hat will be done here. Good product, great fit; sizing was perfect. Delivery time was good so overall an excellent shopping experience. I ordered a gun belt and holster for my husband's birthday. I ordered it on a Monday for his birthday which was coming up on Saturday. I was worried it wouldn't come in time, but it arrived just two days later on Wednesday! And it was exactly as pictured. My husband loves it. I inadvertently ordered two of the same thing (the ordering part of the website was cumbersome on an iPhone). A polite and competent customer service guy fixed everything the next day. 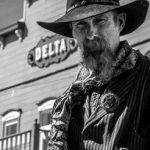 I live in Prescott AZ, a Victorian/ western town, and work here as a bespoke boot maker, using techniques and standards from the craftsmanship period of the early 1900s. I decided years ago to wear only cotton, as far as possible. I find the stylings and fashions created and provided by the Historical Emporium to be just right for everyday wear in my town and my general life style without being a costume. Thank you and keep up the good work. As y'all know I make a lot of purchases for our male tour guides. Not only do the guys get a lot of compliments, but the quality of the costumes are great! I bought two , one for my wife and one for me, we love both holsters great leather and great fit. Customer service is first rate. needed a white dress shirt. I saw your site online and found the shirt I wanted. Your staff was very helpful, considerate, and knowledgeable. Thank you.